Most people know what a miter saw looks like. Whether or not they can place the name to the machine is another matter. Someone who has experience working with wood will know what a miter saw is and what it does, whereas someone who is not as experienced may simply say that the machine is used to cut wood. Regardless of experience, someone who intends to cut wood at varying yet specific angles should be interested in exploring what a miter saw is and which one is the best to buy. This guide is will assist anyone who desires to know what the best sliding compound miter is. For any consumer, buying the best of the best is in one’s best interest. The overall conclusion of what is “best” may be different from person to person, as each person will know what his or her ideal miter saw will be able to do. Even so, by the end of this guide, each individual woodworker will know which sliding compound miter saw is the best for him or her. For those who are not yet woodworking-adept, a sliding compound miter saw is different from other types of woodworking saws. By definition, a miter is “a joint made between two pieces of wood or other material at an angle of 90°, such that the line of junction bisects this angle.” For instance, a picture frame has four corners where, in each corner, two pieces of wood meet to form a joint. Miter saws are used to cut the wood at the specific angle when forming a joint. As the name suggests, the sliding compound miter saw has the capability to slide the actual saw head while it is running. Unlike a standard stationary compound miter saw, the sliding compound miter saw allows for a bit more flexibility and range when making cuts for miter joints. Simply put, the sliding compound miter saw easier to use than a stationary compound miter saw. It also goes without saying that the sliding compound miter saw can do everything the stationary ones can do as well. The sliding aspect is just an extra feature that proves useful for both amatuer and expert woodworkers alike. In addition, the sliding part of this tool is allows for a longer cut than when using any other miter saw. Many of the safety tips that can be given when discussing a sliding compound miter saw is applicable to most other woodworking rules. For example, it is important not to put any limbs near the moving saw blade, even as a joke. It’s never funny when an accident in the workshop happens. One should always keep his or her hands behind any guard or on any handle when operating the machine. Another safety tip when operating the saw is to wear proper protection, such as safety goggles, earplugs, and gloves. Proper maintenance is also another important part of safety. Poor maintenance can lead to malfunctions, which is especially dangerous when operating the saw. One final safety tip is specific to sliding compound miter saws in particular: do not cut pieces of wood that are small than twenty centimeters. The miter saw just simply isn’t designed for that kind of cutting and can be dangerous for both the woodworker and the saw itself. There are a variety of other features that are useful in this type of saw, aside from the sliding parts. Some basics to be on the lookout for are amps, blade size, dust bags or blowers, guides, and brakes. Amps will measure the power of the motor. A higher amperage will mean more power. Blade size will dictate how long of a cut a woodworker can make. The longer the diameter of the blade, the longer a cut can be made. A miter saw should have a way to keep the work area clean. Some saws will have a bag for the sawdust to go and some will have a blower to keep the area dust-free. Guides are lights or lasers to indicate where the saw will cut. Electric brakes are placed in miter saws so when the finger comes off of the trigger, the blade stops as quickly as possible. This is an incredibly handy safety feature when the machine is running. It’s even better to have when the woodworker is a younger person or inexperienced with larger machinery. These are not all the features of miters saws but are good to be aware of before purchasing a miter saw for the first time. The Dewalt 12” Double-Bevel Sliding Compound Miter Saw comes with a saw blade that is twelve inches in diameter. While this saw does not come with a stand, it has a handle designed for comfort and added portability. This particular Dewalt miter saw features an integrated XPS cross cut positioning system. As far as power goes, this miter saw has fifteen amps of power and reaches up to 3,800 rpm. Sporting a stainless steel coating, this miter is sturdy and durable. One advantage of this miter saw is the stainless steel coating, which is forgiving on general wear and use. A disadvantage of this saw is the lack of a stand. As the name suggests, the Delta Shopmaster 10” Slide Miter Saw with Laser comes with a saw blade reaching ten inches in diameter. The saw comes with table extensions for supporting longer pieces of wood. Also included with the saw is a laser with an on and off switch, allowing for more precise cuts. The amperage comes to fifteen amps total and the saw comes with an easily accessible bag for holding all the excess sawdust. An advantage of this miter saw is the weight. Coming in at about 27 pounds, this slider compound miter saw is fairly lightweight for its kind. A downfall is the size of the blade, which won’t allow for the longer cuts in comparison to a twelve inch blade or longer. This Dewalt miter saw comes with a twelve inch saw blade and features a dust bag for easy cleanup and a side handles in the base for easy movement. The Dewalt 15-Amp 12” Single-Bevel Compound Miter Saw is 47 pounds and has a cam lock miter detent override that prevents a woodworker from twisting the handle to lock onto the correct angle. 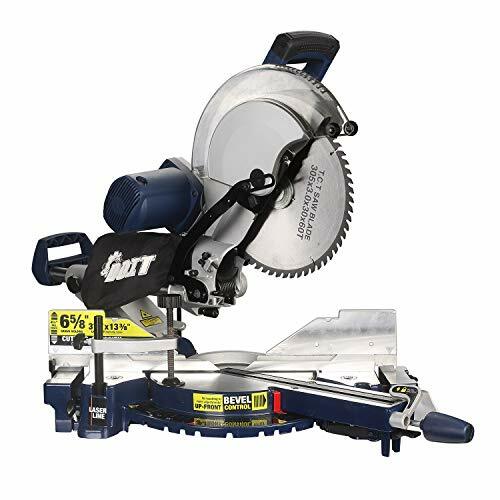 This miter saw also is coated with a stainless steel coating for protection and its saw blade reaches up to 4,000 rpm due to its fifteen amp motor. 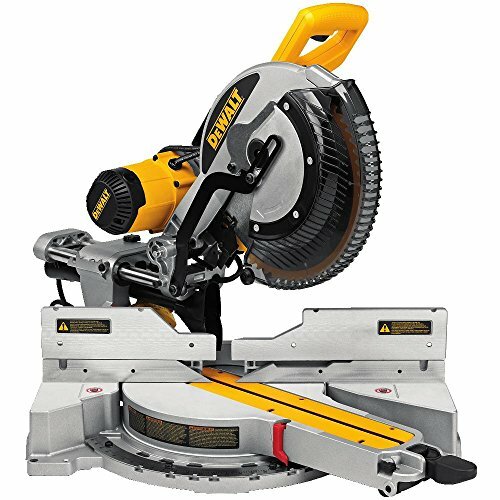 Some advantages of the Dewalt 15-Amp 12” Single-Bevel Compound Miter Saw include the rotations per minute and the cam lock miter detent override. Both of these features are fairly unique to this particular saw. A disadvantage of this miter saw is the lack of an LED or laser cut line. This makes it more difficult for precision cutting. This saw is called the Bosch 120-Volt 12” Dual-Bevel Glide Miter Saw and weighs a whopping 88 pounds. This saw also has a stainless steel composition but comes in the sleek color of blue. The twelve inch blade allows for a fourteen inch horizontal cutting capacity and a variety of other lengths depending on angle. The handle comes with a trigger that works for left-handed and right-handed woodworkers alike. This saw also comes with a dust chute for ridding the work area of sawdust. 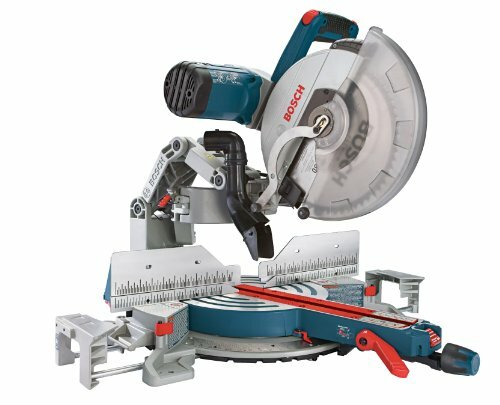 The advantage of the Bosch 120-Volt 12” Dual-Bevel Glide Miter Saw is the dual-bevel glide aspect. This feature allows for better control over the cuts. The clear disadvantage of this miter saw is its weight. Almost 90 pounds of weight will most certainly require the need of assistance from another fellow woodworker. The Hitachi 15-Amp 10” Single-Bevel Compound Miter Saw is 24 pounds and comes with an easy-to-use dust bag. Also featured in this saw is a fifteen amp motor for high power cutting jobs and a large table for larger projects and pieces. The saw is also useful in that the miter ranges 52 degrees to the right and the left. An advantage of this particular miter saw is its weight. Weighing less than 25 pounds, this saw is ideal for the single woodworker who doesn’t need or want anyone’s help. A disadvantage is the lack of any clear way to mark where to cut. A lack of laser guide or lights makes the cutting process only slightly more difficult. The Makita 10” Dual-Bevel Sliding Compound Miter Saw can reach up to 4,400 rpm with the two 18 volt lithium-ion batteries it uses for power. The batteries are included. The saw also comes with a neat dust bag for easy cleanup and two dust collection ports. This miter saw also reaches fairly heavy weights of 81 pounds but can reach up to 334 cuts per charge. The blade that comes with the sliding compound miter saw is ten inches in diameter. An advantage of choosing this miter saw is the use of batteries over strictly corded power sources. In addition, the rotations per minute allow for some clean and precise cuts. A downfall of this saw is that it weighs over 80 pounds. This can be problematic for woodworkers who need a helping hand whenever the saw needs to be moved or for the initial setup. This Bosch 10” 15-Amp Dual-Bevel Axial-Glide Compact Miter Saw is a model that features an ambidextrous handle with a soft grip for maximum comfort. As the name suggests, the saw blade is ten inches in diameter and is powered with fifteen amps of power. The miter saw weighs 64 pounds and comes in blue. 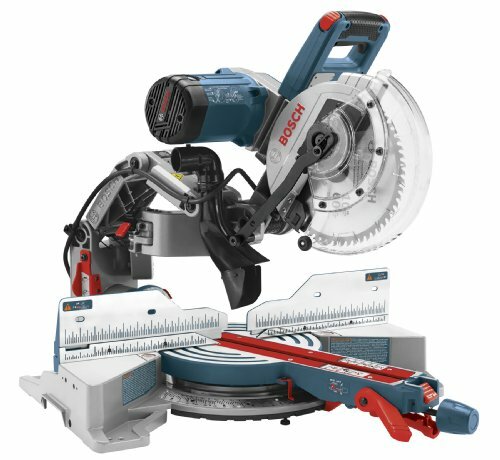 The Bosch 10” 15-Amp Dual-Bevel Axial-Glide Compact Miter Saw also has a Lock-and-Chop feature that makes use of the base and crown molding the cut clear and concise cuts. The upside of purchasing this particular miter saw is the comfort and control provided by both the handle material and the Lock-and-Chop feature. A downfall would be the lack of a laser or light guide for precision cutting. As this model of Hitachi miter saw named, the saw comes with an easy-to-use laser marker for precision cutting. 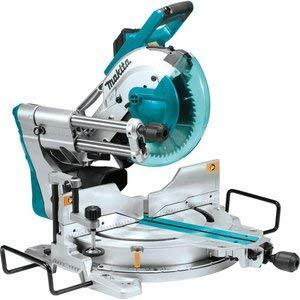 The miter saw works with its 15 amps of power and allows for longer cuts with it twelve inch diameter saw blade. The Hitachi 15-Amp 12” Dual-Bevel Sliding Compound Miter Saw with Laser Marker weighs 59 pounds and has a vertical handle made with a vibration reducing elastomer grip. This saw comes in the color green and has clear indications on the miter and bevel scale. A positive aspect of this miter saw is the handle and its natural design. The laser guide is also incredibly useful with the blade length long enough to make longer cuts. A possible negative side of this miter saw is the teeth on the saw blade isn’t perfect for fine-detailed finishing work. This Dewalt Sliding Miter Saw has an integrated cut line cross-cut positioning system for better cuts and weighs a mere 30 pounds. The saw is powered by lithium-ion batteries and is 24 volts. The average cuts this saw can make on one charge is a total of 183. The saw has a blade that is 7 ¼ inches and features an oversized bevel scale for easy bevel angle adjustments. The Dewalt Sliding Miter Saw is perfect for those who want a lightweight and portable saw. This is due to its battery functionality and it’s weight. The natural downfall is the saw blade coming in at 7 ¼ inches. This saw is not something that is the best for a single workstation. The Wen 12” Sliding Compound Saw runs on fifteen aps of power to deliver up to 5,000 rpm. The 12 inch saw blade is 40-toothed and the miter saw comes with a handy dust bag for all that sawdust. The saw weighs an average weight of 42 pounds and comes in the color blue. The sliding compound miter saw can also miter up to 45 degrees to the left and the right. The Wen 12” Sliding Compound Saw has the advantage of an incredibly high rotation per minute count. This is easily countered with a clear lack of cutting guide and other fancier features. It is simply a standard sliding compound miter saw and not much else. Each sliding compound miter saw has its pros and cons and each one is designed to be the best for different people in different scenarios. For woodworkers who need a solid but fancy miter saw, the title of the best sliding compound miter saw might go to the Makita 10” Dual-Bevel Sliding Compound Miter Saw or the Bosch 120-Volt 12” Dual-Bevel Glide Miter Saw, due to their heavier weight but better features. For perhaps a more novice woodworker, a lighter and more casual miter saw with a few extra features may be the best. In which case, the best for that woodworker may be the Delta Shopmaster 10” Slide Miter Saw with Laser or a Hitachi 15-Amp 12” Dual-Bevel Sliding Compound Miter Saw with Laser Marker. When it comes down to it, the best is what the woodworker wants and needs. Each sliding compound miter saw has its own features that are either useful or useless. A woodworker should never feel pressured to purchase a machine that isn’t just right for him or her.